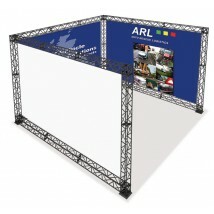 A foldable trade show truss system that is very easy to assemble, pack away and transport. 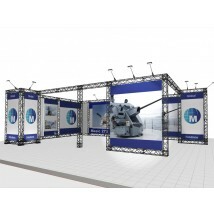 Below you will see a number of popular off the shelf kits but our modular truss system has endless possibilities, so get in touch and we will design a bespoke stand for your next trade show. 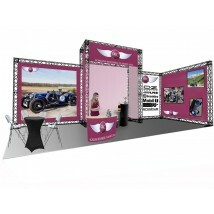 We also offer in house graphic design and can take your logo and concepts and turn them into a show stopper. 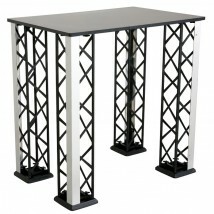 The truss is made from strong aluminium and steel composite material and can be easily added too as you grow. 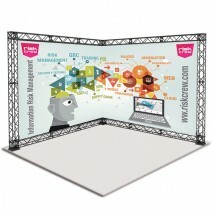 We also offer a very wide range of exhibition stands at discount prices. 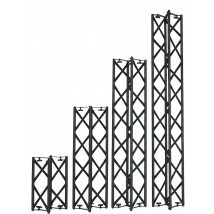 Our folding truss system is our best seller, and for good reason. 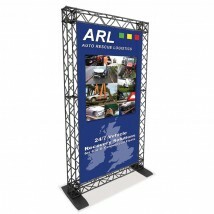 The impressive system is made from an aluminium composite, meaning that it is lightweight but incredibly strong. The folding design and lightweight construction mean that it is incredibly portable and can be easily self-assembled with no expert knowledge or tools required. 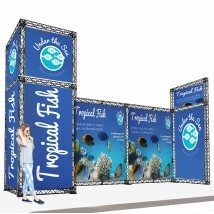 The modular nature of these kits means that as your business grows, your stand can grow with it, simply adding on more components, as and when you need them. 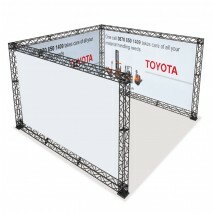 The system is also reconfigurable meaning that when not at a tradeshow it can be used in a showroom or retail environment in a different format. The impressive system is capable of 4.5m spans, unassisted, meaning that we are able to create very large stands at a fraction of the cost of other systems. 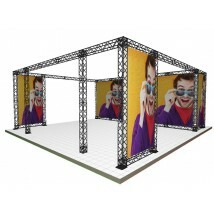 With all of our Truss displays we are also able to offer free 3D design or customization of any kit. 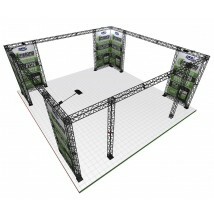 Because the kit is modular we can easily adapt to your needs and provide you with a 3D render of any custom stands that you are interested in. The possibilities are endless. 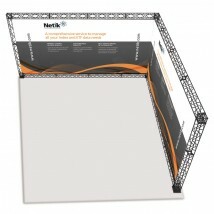 The maximum unsupported span we can achieve is 4.5m, however as long as this is satisfied there is no limit to the size of a stand you could achieve with our system. 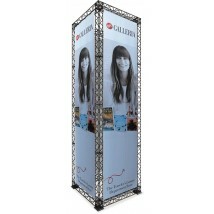 Our portfolio of pre-designed stand includes examples up to an impressive 50m2. Yes! 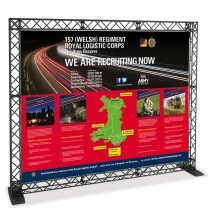 Our vibrant 150W lighting can be simply clipped onto the frame and is a great way to make your graphics and products even more prominent. 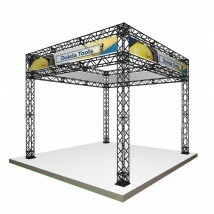 Our truss system is constructed from a lightweight but durable aluminium composite material. For reference, a 90cm module weights 2kg, whilst a corner block is around 1kg. 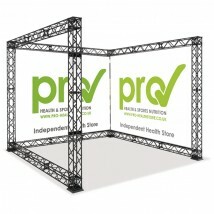 As it is lightweight even a large 4x4m stand weights only 60kg compared to 117kg for an equivalent Vector stand. 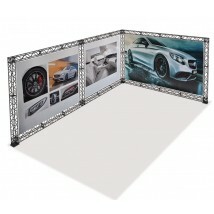 We currently offer module lengths of 30cm, 60cm, 90cm and 120cm as well as all of the other components you need to create a show-stopping stand. 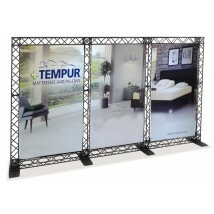 We keep a high level of stock to ensure you can get your stand as soon as you need it. 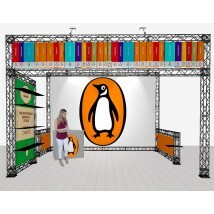 We can offer counter, shelving and lighting that can be attached to your stand, as well as a huge range of freestanding products from digital signage to exhibition furniture and everything in between to make your exhibition a success. Why is it called reconfigurable / modular? 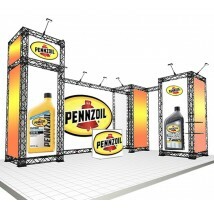 We call these stands “reconfigurable” or “modular” because you are able to simply add or take away components to change the size or style of your display. 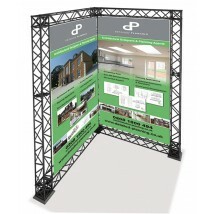 This makes these stands even better value for money as they have even more applications. 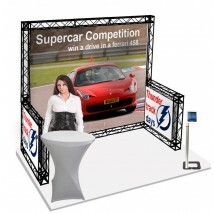 In the past, we have supplied exhibition stands with the potential to also be used as retail or showroom displays. 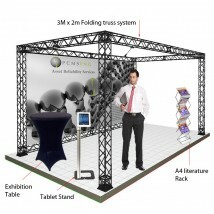 The expandable nature of the system is also great, as it allows your stand to grow as your business does, reducing the excessive cost of a full stand rebuild. Our system is quick and simple to put together, with no tools required, but can be sped up with an electric screwdriver. To connect components together you simply have to unfold them, line up the thumbscrew with the thread and turn until tight. 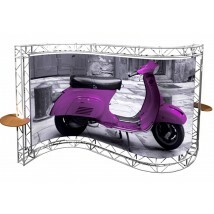 Once you have placed an order we will send you information about the easiest ways to assemble your specific design. 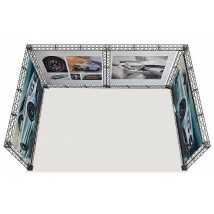 Our folding truss system is constructed from an aluminium composite material. 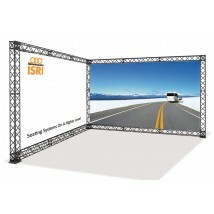 This composite, combined with the truss style, allows the system to be incredibly strong but still lightweight and portable.